Some of my favourite literature has unreliable narrators, The Great Gatsby, Heart of Darkness, Catcher in the Rye, The Adventures of Huckleberry Finn – the latter of which clearly reaches into the children’s literature genre. For children, it can be fun to spot an unreliable narrator and makes for great discussion. Some narrators are unreliable simply by being young – the story is told from their first person perspective and they are too immature to appreciate everything that’s happening around them. In many ways the reader can see through this and may appreciate that they themselves have a greater understanding of the narrative than the person telling them the story. Diary form novels fit easily into this genre – Wimpy Kid, Emily Sparkes, Dork Diaries. We can see the author’s intent where the first person narrator of the story is playing catch up with the reader. Then there are more subtle unreliable narrators, perhaps those who are lying to us, to themselves, deliberately or not. I wanted to review two books with unreliable narrators, both of which are for the middle grade readership (9+yrs.) but the two books couldn’t be more different. These are both highly recommended by me. Twelve year old Ivy Pocket is a maid, sacked by her employer at the beginning of the novel, and left destitute in Paris. She is summoned to the bedside of the Duchess of Trinity and asked to deliver a very precious jewel, the Clock Diamond, to Matilda Butterfield in England on the occasion of her birthday for the reward of £500. Ivy agrees, and starts her adventure of gothic charm, ghosts, catastrophe and murder. The brilliance of the novel though, is not so much the somewhat violent action scenes, twists and turns, and great characterisation, as the way in which the story is told. Ivy Pocket is swamped with the most extravagant case of delusional self-belief, believing herself to be above her station, and brilliant at everything. She is hilariously quirky; ebullient, tongue-in-cheek, absurd and captivating. I wanted to read aloud parts to everyone I met whilst I was mid-read. 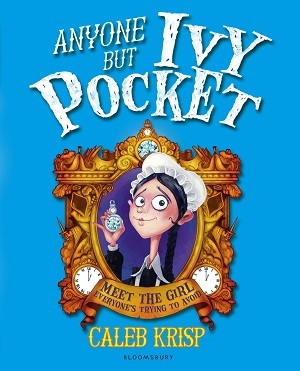 Ivy Pocket also has stock phrases that she repeats throughout the book, giving her great characterisation, added to the fact that almost everyone else in the book is highly satirical, and you have one of the most fun books I have read in a long time. I’m imagining that a child will have to be quite sophisticated in order to appreciate all the nuances within, but once hooked, they’ll devour this and every sequel that follows. It’s reminiscent of Lemony Snicket’s books, and yet highly distinctive. 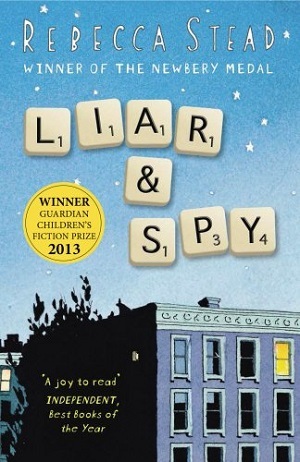 Where Ivy Pocket is playful and verbose, Liar and Spy is realistic, modern and minimalist. Set in New York, the story is mainly told through dialogue. Liar and Spy is narrated by Georges, a young boy whose family is suffering from financial difficulties. Georges tells us about himself, the difficult time he is having in school, and the family he befriends when his family downsizes into a new apartment block. Georges’ Dad pushes him into joining a ‘spy club’ that they stumble upon in the building, and before long Georges is playing at being a spy on his neighbours in the building. The humour within this novel is observational. Rebecca Stead has managed to capture the dialogue, worries, and thoughts of young boys particularly well, and it soon becomes apparent to the reader that everything is not as it seems. The cleverness lies in working out, from the small clues that Stead drops throughout the narrative, whom is lying to whom and whether our narrator can be trusted. In the end, it’s for the reader to understand that if our narrator is living under a delusion, then by default, so are we, the readers. It’s a small, clever book that betrays some youngsters’ fears and anxieties in a subtle, non-threatening and understanding way. Liar and Spy also brings into play how other people live – not just a view of American life for those of us reading it in the UK, but also how different families operate in different ways. It also opens our eyes to some deeper thoughts – what matters in life – how our small actions every day build up to create a bigger picture. It’s a great book, a terrific story, but also makes for interesting talking points as children grow towards the teenage years. Buy your copy here.